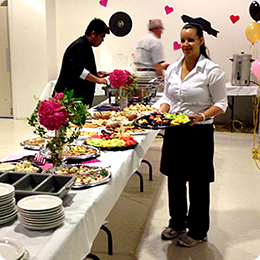 Valley Caterers provides full service catering in the Fraser Valley including Abbotsford, Mission, Chilliwack and Langley. We have been serving happy customers with top quality services for over 32 years, with our "Core Group" having over 100 years of commercial catering experience. We offer full food services and catering to events of all sizes including weddings, anniversary parties, corporate functions, birthday parties and any kind of catering function you can imagine. Valley Catering has travelled as far away as Bowen Island and Whistler to Boston Bar and Manning Park to cater special events. We have a Tractor Trailer Unit with a fully equipped and self-contained kitchen. Our kitchen on wheels allows us to cater large functions anywhere you can imagine. We also have a full Banquet Room which seats 100 people with room for a dance floor and a fully equipped bar. Feel confident with Valley Caterers experience, professional staff, quality food and executive chef with 35 years of doing this for a living and loving it. We will make you look good at your special function for a fair price. We do mobile catering for a living, and love it! Call 604.854.6121 to book your next event now.